The Department of Housing and Urban Development announced two big changes and the reverse mortgage industry is still trying to figure out what it all means. As expected, HUD reduced the principal limits but surprised the industry by lowering the floor from 5.50 percent to 5.00 percent. While unable to predict the future, McCully said it’s likely that a reduction in execution for HMBS will be met with price reduction for lenders as well. 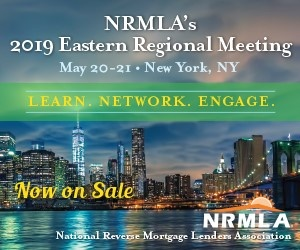 HUD and investors are concerned about the potential for “churning” – where lenders refinance borrowers even if the benefit is minimal – but several lenders told RMD they don’t expect any sort of “refi-boom”. Because rates will have to rise eventually, the HECM Saver is where lenders see the most opportunity. This higher end client – someone with no mortgage balance – has been been out of reach in the past because upfront costs of the HECM couldn’t compete with a home equity line of credit. This segment of seniors is much larger than the current audience the industry has been targeting in the past according to Lunde. His company estimates that the Saver could become 20 percent of all reverse mortgages originated in the next 12 months. “We’re very bullish on the potential volume for the product,” he said.